Air Force Times wants to know: How’s the PT test going? How has the PT test changed for you since the instruction was updated in October? Is the new waist tape rule tougher than the old one? If you’ve failed the waist measurement, have you been referred to the BMI measurement? If you’ve also failed BMI, what’s the next step for you? 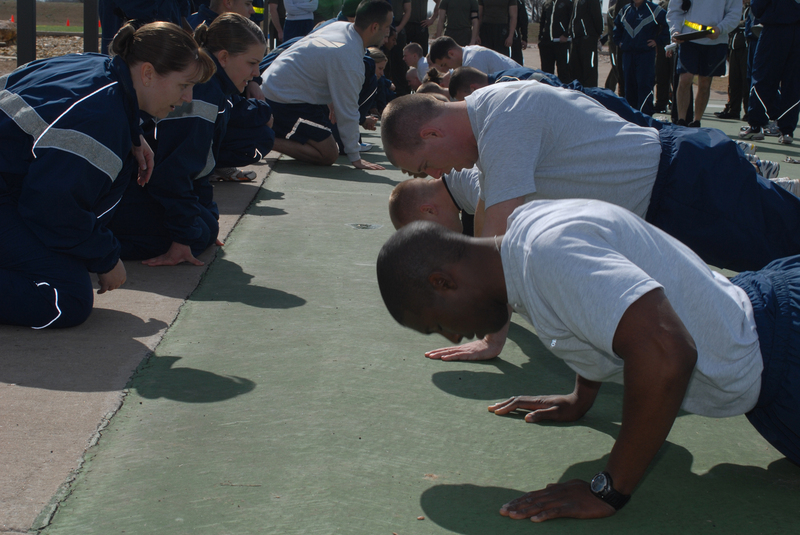 What components of the PT test – situps, pushups, waist measurement, run – have been the most challenging for you? Sound off below or email Oriana Pawlyk at opawlyk@airforcetimes.com. Your comments may be used in an upcoming Air Force Times story. Just a thought, if the militarytimes staff wants the opinions of some of the younger, newer generation of servicemembers… you guys could create official Militarytimes / AF times accounts on reddit and ask members for their opinions directly on subreddits such as r/AirForce. The AF PT test along with the other military physical tests are outdated. They don’t measure any sort of power or endurance output. What part of 1 min of calisthenics is supposed to measure endurance? The test needs to be re-designed to fall more into place with fitness standards of today’s world. Performing well on this test doesn’t answer any questions whatsoever. The most important questions and that is how much and how far can this person carry if needed. How well does this person perform pound for pound? I am a younger generation airmen with a long tradition of military in my family. From my perspective and experience the updates to the PT test are not at all helpful to the AF members. If anything they have played a big part in lowering moral. As time has changed the PT test to mimic the other branches it is apparent that we have forgotten that most positions in the Air Force don’t require an excessive amount of physical activity. Running, weight lifting and other physical requirements are job specific. Time limitations on strength such as push-ups or sit-ups tests should not be practiced as it leads to improper form, miscounting and at times injury. Their biggest mistake was making the walk a pass or fail score. Taking a point value from a cardio portion of the test leads to more failures of members recovering from an injury who are reasonably trying to participate in what they can physically. What is the point of having the walk if is only pass or fail? Many members who once scored in the 80’s now fail the overall test because there is no point credit for cardio in the walk. It is too much of a gap to fill with points from the remaining test components and too much to ask of a member to be superhuman in all other test component areas to make up for no points earn in the cardio walk. It would seem our leadership has no interest in making things work more logically or effectively. The Fit to Fight program has become more a threat to its members more than a motivating program to stay in shape. I was in a coma in 2003 for diverticulitis and had multiples surgeries on my stomach and a few more surgeries over the years. Since then I have never been able to do situps like everyone else. However I have no problem doing the run and pushups. Everyone that gets on a profile just because makes it bad for the rest of us that legitametly need to be on a profile. Besides that since I cannot do the situps even if I score a 90 or above I have to test again in 6 months. There is something wrong with the Physical Fitness test when I can run faster, do more push-ups and sit-ups than other members, but earn a lower PT test score than small, skinny guys. I get why they want the waist measurement…to prevent the government from paying a lot more for medical care in the future…but they implemented it wrong. It should be part of the PHA. Make that annual appointment worth it. Instead of learning what to answer on an online survey and then reporting to a SSgt in the Med Grp who only asks if I feel like hurting myself…make that where you report for height, weight, and waist measurement. That’s where you need to hold people accountable for future health costs, not on a physical fitness test where being skinny can earn you more points than physical fitness exercises. I’ve always failed to see how someone who only trains to be able to run 1.5 miles, perform a minute’s worth of push ups and sit ups, and maintain a waist size under 40″ is in better physical shape than someone like me who hits the gym 6 days a week, sometimes twice daily. I’d rather have someone go to battle with me in beastly shape than someone scrawny twig or Danny DeVito look alike. If you fail the Air Force PT test or get injured performing a push up, sit up, or 1.5 mile run, you are weak and shouldn’t be in the military. How does testing 1-2 times per 365 days lower morale? You should be working out at least 3 times a week. This is the military, even if you work at the MPF you should be in shape. You’re representing the Air Force, don’t look like a bag of crap. -I do think the image of the Air Force is important, but as one person pointed out the majority of the AF members do not need to be in outstandingly fit; unless you are in obvious AFSC (i.e. PJ, CCT, TAC-P, etc). I have been in over 25 years and have never seen anyone not capable of performing their duties because of the physical fitness. My biggest complaint is that the young airman are more concerned over passing the PT test than doing their job. -Ultimately, the Air Force PT program is about changing a culture, to be fitter, to lower VA Health cost in the future; it always comes around to $$$.